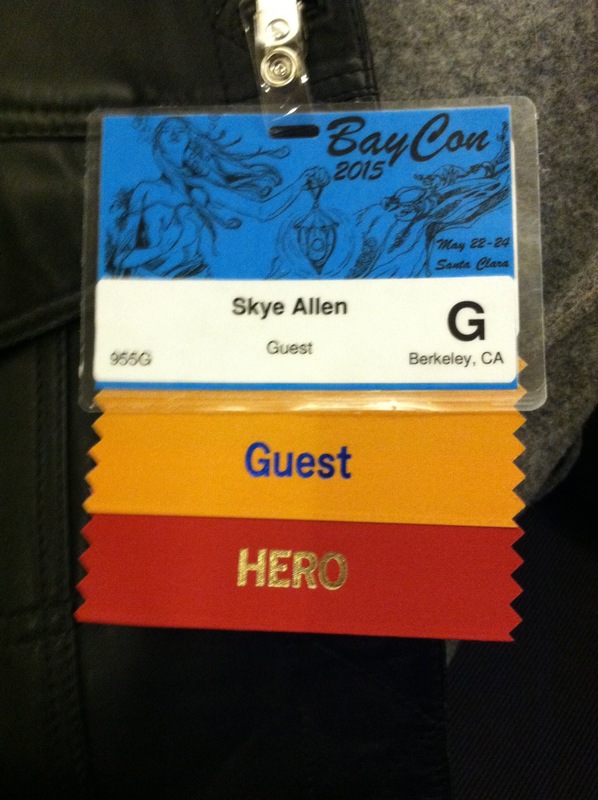 BayCon 2015 was waaaay back on Memorial Day Weekend. It’s stayed strong in my mind ever since, but have I posted my tiny little con noob thoughts? Nope. But do let’s do the time warp. I spent an hour or so in the fan table area because there was a vacant couch there, going over my story “Spring Can Really Hang You Up the Most,” which I was going to read at the themed reading on Music and Musicians in Science Fiction and Fantasy. I hadn’t read the story in the print edition of Of Dragons and Magic, so I went through and noted with shame all the sloppy places where I used words like “soft” or “bubbly” more than once in the same paragraph (also underlined all the internal dialog that should have been printed in italics in the book). I walked through the lobby to admire the costumes and soak up the general multi-colored hair and nerf weaponry vibe. And then I went to my reading, all hyped up and semi-ready, and then it was canceled after 10 minutes due to the rest of the con being, understandably, over at Meet the Guests with Amber Benson and Seanan Maguire. Jim Partridge and Emily Jiang chatted about things way over my head, like Korean boy bands from the 90s, and I pretended I could keep up. Then Jim went to listen to Broceliande and Emily and I went to the bar, where we had one of those long, profoundly satisfying conversations about things diversity-ish and being the lone representative of an outsider group among people with traditional privilege and how very, very hard it is to talk about situations like (in my case) bi- and transphobia in 3rd and 4th wave feminist circles or (in Emily’s case) being expected to know everything about Asia because she’s Chinese American. And Emily read me a page from her beautiful book, Summoning the Phoenix, which is about Chinese musical instruments. And I gave her my CD. And then I drove home, multitasking all the way by working out a harmony part to Pretty Fair Maid in the Garden so I wouldn’t feel like I was completely stepping out on the whole rest of my life all weekend. Next up, a quiz on alien DNA and Earthling star encounters!